The University of Wisconsin women’s hockey team (23-3-0, 13-3-0 WCHA) swept the St. Cloud State Huskies (8-18-2, 3-14-0-0) in a two-game series at LaBahn Arena over the weekend. A Badger victory was rarely in doubt, as the Huskies succumbed to a superior performance from the Badgers on both sides of the ice, much like their previous meeting in December. In Friday’s contest, the combination of a clean sheet from junior goalie Kristen Campbell and a group offensive effort resulted in a decisive 5–0 victory for Wisconsin. Scoring for the Badgers were junior Alexis Mauermann, freshman Sophie Shirley, senior Sophia Shaver and junior Mekenzie Steffen, who recorded two goals on the night. While the Badgers sustained offensive production throughout the game, one moment in particular quickly catapulted the team into the driver’s seat. At just the one-minute mark in the third period, Steffen recorded her second goal of the game, and after the ensuing faceoff, Shirley tacked on another goal just six seconds later. The six-second gap between goals is a new school record for time elapsed between scoring plays. 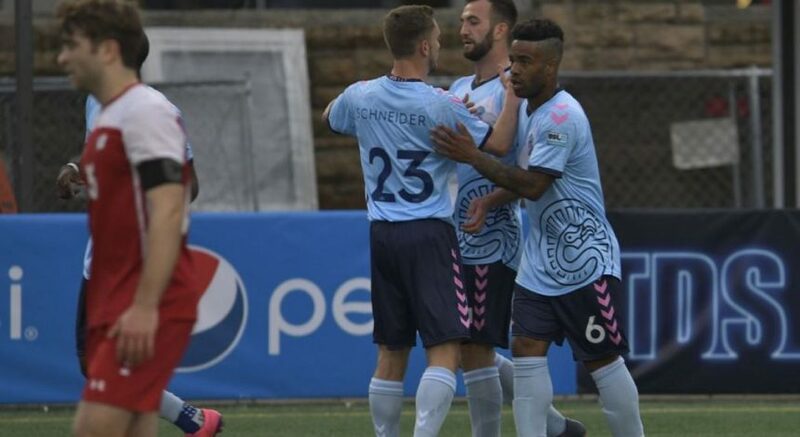 Saturday’s game was unfortunately devoid of any high-octane moments similar to the record-breaking flurry of goals enjoyed by the Badgers the previous night. 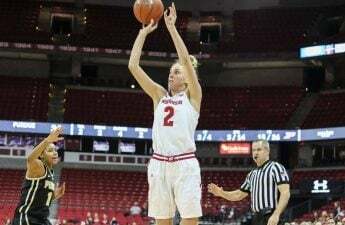 The Badgers could have used another stroke of genius in Saturday’s contest, as they struggled to pull away from the Huskies until late in the game. The Huskies opened up scoring Saturday with a goal from Hannah Potrykus less than five minutes into the first period. 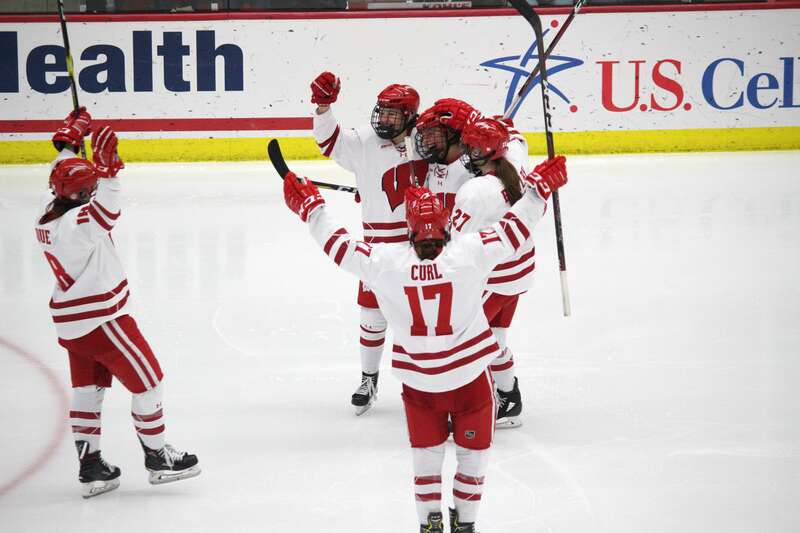 Wisconsin quickly responded with two first period goals of their own from freshman Britta Curl and junior Abby Roque, but failed to add to their one goal lead until later in the third period. 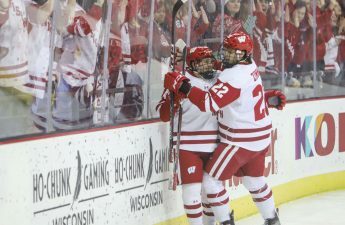 While Saturday’s victory was not as decisive a victory as Friday’s, Wisconsin displayed a plethora of offensive weapons with eight goals over the weekend. Yet, perhaps the more impressive statistic was how separate players scored for the Badgers. Seven different team members added to the weekend’s score sheet, with the lone multi-goal performance coming from Steffen. Wisconsin’s star power is not limited to a small group of high output offensive players. Rather, it is beneficially spread out across the roster such that the Badgers remain a highly threatening offensive team no matter who Head Coach Mark Johnson chooses to put on the ice. Looking forward, Wisconsin will take its talents to Bemidji State to hopefully continue their dominance over the Beavers. The Badgers have not fallen to the Beavers since the beginning of 2015.